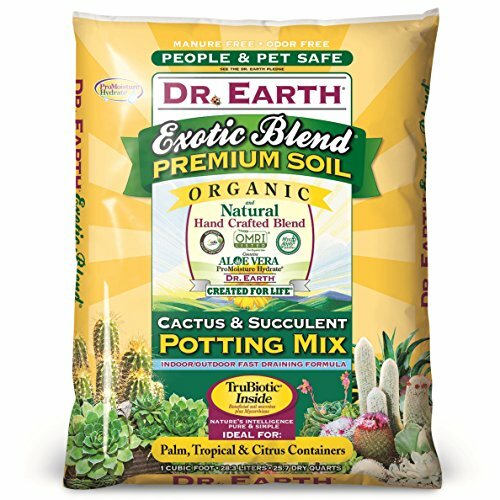 Dr. Earth Exotic Blend Premium Soil Organic Cactus & Succulent Potting Mix is just what your plants will love. This organic succulent and cactus potting soil mix is specially blended with an incredible list of beneficial ingredients. There are numerous reasons for choosing a succulent and cactus soil blend that includes live beneficial microbes and mycorrhizae. The symbiotic relationship is extremely beneficial to your plants. Unlike other brands the Dr. Earth 810 Exotic Cactus & Succulent Soil is third-party “MycoApply” ceritfied to verify the amount of mycorrhizae included in the package. Don’t fear that the bag may be old and have less. The soil mix is so well engineered that the live mycorrhizae will actually keep increasing. Organic potting mix is highly recommended for a host of reasons. You will not only be helping the environment but your succulents and cactus will thrive. Many non-organic soil mixes will end up essentially sterilizing your soil from all the beneficial microbes that are so beneficial for a healthy plant. The Dr. Earth brand has all the right ingredients in the right proportions for healthy succulents. Along with the soil microbes and mycorrhizae is kelp meal, fishbone meal, perlite, dolomite lime, gypsum, peat moss, bone meal, composted green waste, kelp flour and feather meal. These are carefully formulated for nutrition and also to provide the best pH level for your plants. We have had more success with the Dr. Earth 810 Exotic Cactus & Succulent Soil Potting Mix than with any other brand. It is now the only one we purchase. Click through to choose from both size packages.